I don’t know if you’ve ever had a conversation with Cat. No, not A Cat, The Cat. As in the creator and founder of TBD Media. Anyway, she’s my new boss, and I’m her new graphic designer, and this blog reveals how we got to that place. So, back to conversations with Cat. She talks at warp speed because her brain is seriously processing thirty dozen things at once. Sometimes it’s hard to keep up, but it’s worth it when you do. After freelancing with TBD for a few months last year, I put it out there that I’d love to have more work. Weeks later, a short burst of a phone conversation ensued wherein Cat revealed there may be a full-time position for me at TBD. Buried amidst the rapid-fire thoughts, was the offhanded directive to “put something together” and we could hammer out the details later. I hung up not really knowing what I was supposed to do next. I’d been freelancing and off the job-market for so long that I had no idea what protocol and practices I was supposed to follow. The fact that this would be a remote position had me wandering in uncharted territory. I’m sure I tapped google with “personal pitch deck” and other such searches, but eventually decided I was just going to make up my own thing. Fig 1. THE COVER PAGE: I debated whether I should have a compelling photograph or portrait on the front, but opted to keep it simple. Fig 2. 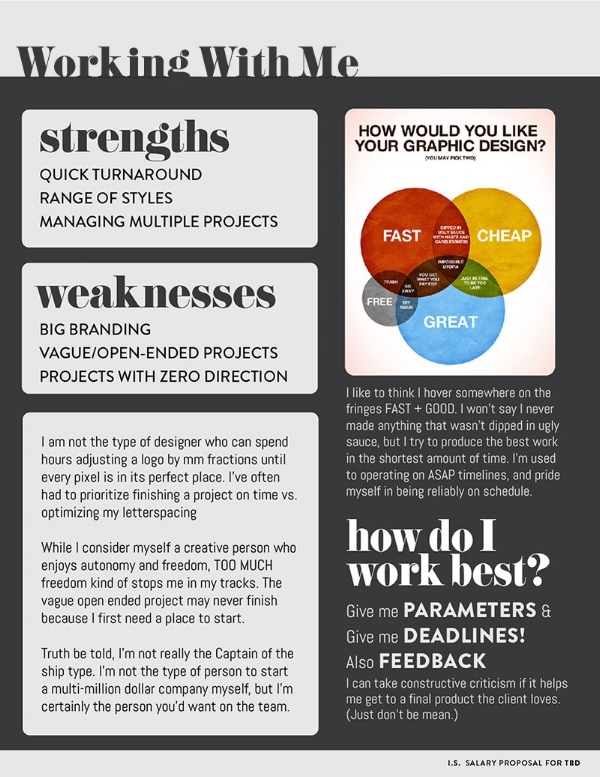 EXPERIENCE: I had already been freelancing with TBD for a few months, but I wanted to present a visual overview of my prior history and qualifications that went beyond the standard resume. 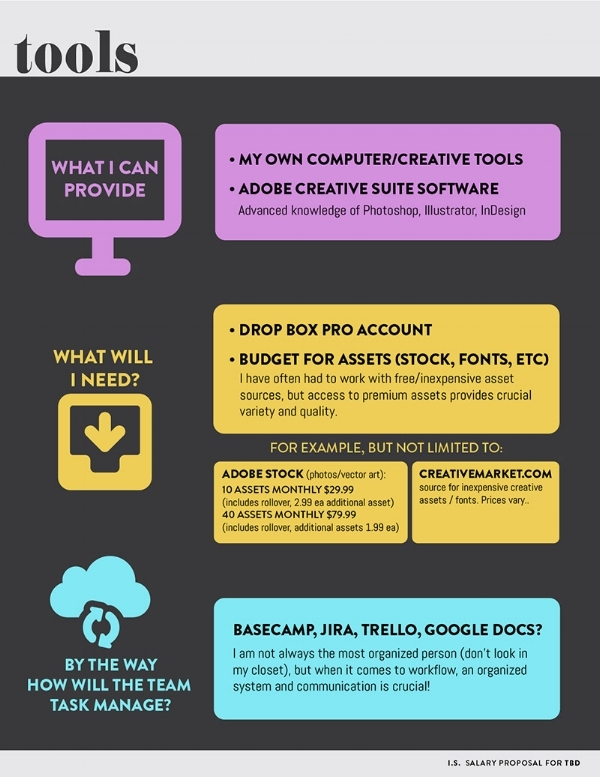 I also wanted to highlight key skills gained from different jobs or clients. Fig 3. TOOLS: The job I was pitching for didn’t quite exist yet and would be a new position for both of us. This page was by no means complete, but it set the stage for working together by listing tangible things I could bring to the table, and other things I needed to get the job done. Fig 4. WORKING WITH ME: This was the hardest page to put together. Reflecting on my own strengths and weaknesses was a challenge, but it was a good exercise to identify how I would bring value to the team, and what areas I struggle with. Fig 5. SALARY: I'm not about putting my salary out there so I replaced the actual numbers with “$$” for the purpose of this blog post. 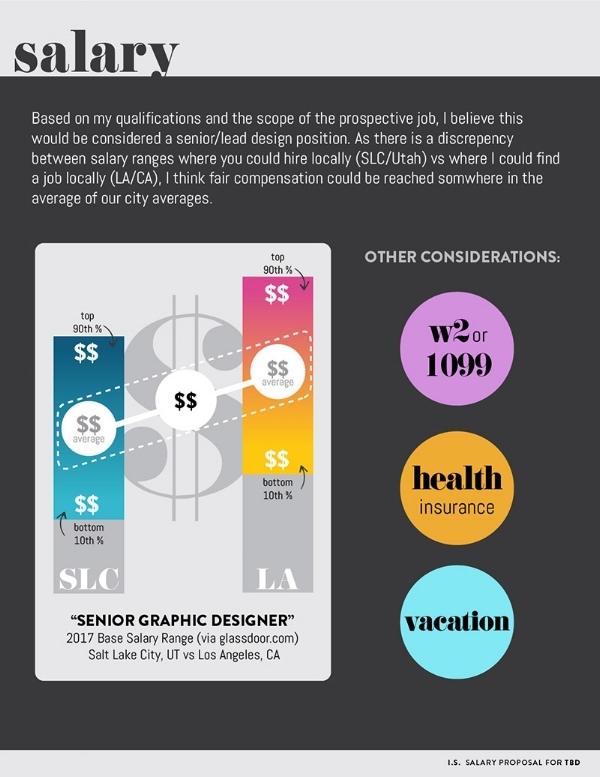 Honestly, I made the SLC/LA graph mostly to give this page a cool visual, but it also justified the target salary I was comfortable with, while taking into consideration this was a remote position not tied to one region. I used glassdoor.com for my numbers, but also corroborated the figures with other sources on the internet. Fig 6. GOALS/PERSONAL STATEMENT: This page wrapped things up with some personal and professional ambitions and hopes, as well as a heartfelt summary of why I wanted this job. And that, my friends, is how I sealed the deal and landed my amazing new job with TBD Media. Now back to work!